A different forest, a different mood… Winter is fluffy, frosty covered the whole earth with snow. Yes, and the trees covered with a warm snow blanket. Winter in Russia is an incredible beautiful season. A lot of snow, frosty, and all this silvery-white beauty sparkles day and night. During the day from the not hot shine of the sun, if it suddenly peeps out from behind the clouds, and at night from the shine of the moon. But even if there is no moon, the snow still does its job – it is light on the street even on the dead of the night. And how beautiful blizzards and blizzards. After all, if you listen, you can hear the magnificent song of the wind. And moreover, it sounds differently: at the blizzard the wind howls a little more plaintively, but at the blizzard everything is different, more ferocious. There is another kind – blizzard. At this point it is worthwhile to listen more closely, because it may seem that the whole world has sounded with the stern howl of a blizzard. But this does not happen often. More often, winter just quietly covers the ground with snow and gives people the opportunity to go skiing or sledding, or even skating, if there is a pond or river nearby. 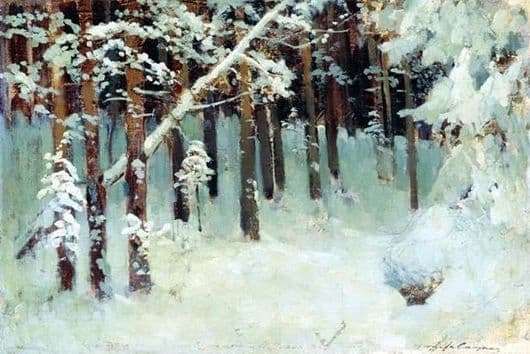 Levitan proved again and again how beautiful the forest season is at any time of the year. He depicted the forest in spring, summer, autumn and winter. And each time its forests were different and surprisingly beautiful. Many skeptics did not believe in what is so beautiful in Russia. But the way it is! The beauty of nature has always surprised people, and it was precisely this surprise and delight that the artist could always pass on successfully. The main thing is not to be surprised and not to stop painting landscapes and making the world more beautiful. canvases do not just hang at exhibitions or at home – they give us aesthetic pleasure. And to see the winter forest is not always possible for those who are forever mired in urban slums. You can see this beauty with your own eyes, or you can see beauty through the eyes of the great artist Isaac Levitan.